Everyone seems to be aware of a central problem that arises in dream analysis or “interpretation.” That is, dream workers often overstep their boundaries, and effectively invade the dreamer’s autonomy by making precipitous conclusions about the meaning of the dream, or its images. Jung was the first to announce that the dreamer was an essential part of the analysis of any dream, and that the dreamer’s unique experience had to be taken into account for any interpretation to be valid. He introduced amplification as an effort to obtain the dreamer’s unique associations to the dream imagery, and amplification survives today in many forms. In more recent times, disciplined approaches like Ullman’s group method, and Delaney’s Interview Method, endeavor to do an even better job in protecting the dreamer from arbitrary projections. 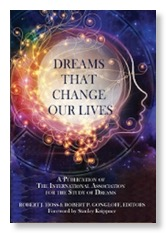 Taylor joins Ullman in trying to protect the dreamer by having group members precede their comments with, “If this were my dream,…” But beyond that, Taylor believes that projections are inevitable, and thus takes a less restrictive approach to the dream process. Some would say that human nature, or ignorance of countertransference, accounts for the difficulty in keeping our hands off other peoples’ dreams. But I think that the problem doesn’t reside as much in the dream worker as we have previously thought. I believe that projection arises as a consequence of our view of dreams. By believing that dreams are their content, we set in motion a process of trying to discern what the images mean, or what they are saying. This is same approach taken by art critics who try to analyze the statement that the artist is making. Critics comment on whether the artist succeeded in conveying the presumed message, or not, and whether the message itself is valid. This preoccupation with the meaning of the content, and the intention of the creator, influences dream analysis, as well. For as I have pointed out elsewhere, the ancient Greeks set this whole project in motion by treating dreams and art as representative of something else (our waking life). 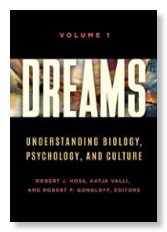 Consider this possibility: that to the extent that dream workers believe that dreams are comprised of content to be interpreted, they will almost inevitably offer their own conjectures based on their own experiences and assumptions. A content focus thus encourages invasive projections. 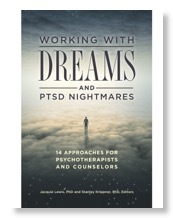 In contrast, a process orientation the dream analysis–in which the dreamer’s feelings, thoughts and actions are seen to influence the dream’s outcome–focuses on what actually transpires during the encounter. This focus does not encourage invasive projections, because it is based almost entirely on what is clearly evident in the dreamer-dream interactive process. So why do dream workers overstep their roles? Even the great teachers of our time? In my opinion, it is because in spite of their stated positions, they were wedded to an underlying culturally embedded view of the dream as content rather than interactive process, and thus infected the dream work with their own subjective pronouncements. 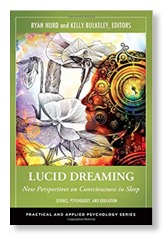 The solution to this problem, therefore, is not having a more disciplined approach to dream content, but having an altogether different view of the dream, in which the dream worker’s responsibilties have virtually nothing to do with interpreting dream content. Again, I refer you to the FiveStar Method as an example of an approach that makes the dream process the centerpiece of the analytical work.